I’m super excited about this being my 10th year of teaching. Although this year, I’m not teaching in the traditional sense of having my own classroom, I feel really lucky to work with educators as they design exceptional learning experiences for students. Over the last month I’ve been taking some time to reflect on my 10-year journey and all of the opportunities that have lead me down my current path. One such reflection was about my experiences with blogging and thinking about the reasons why it all began. In 2016, I was looking for an easy way to connect with parents around the work that we were doing in the classroom. I wanted to parents who weren’t always able t o visit the school to know what was happening and to feel a part of the school experience and learning of their child. Even if only 1 parent took the time to read the blog, I found value in writing it. My weekly writings also offered me the chance to reflect and think about what we were doing in the classroom and the reasons why. I truly enjoyed blogging weekly and for the most part, kept it going for the last 3 years. In September 2017, I started blogging for the Heart and Art of Teaching and Learning and it’s truly been an honour. Every month is an opportunity to reflect on my practice and write in the hopes of inspiring even 1 new teacher to perhaps try something new in their classroom or possibly consider an idea from a different perspective. When put that way, the task now seems a little daunting. For this post, I wanted to get back to the heart of what inspired me most about this online community and the resource that is its namesake. Over the summer of 2017, I was sent the Heart and Art of Teaching and Learning resource. I have to say that the subtitle is a little misleading. It reads: Practical ideas and resource for beginning teachers. Perhaps it should read: Practical ideas and resources for ALL teachers. Even though this is my 10th year teaching and perhaps I’m not still a beginning teacher, there are so many amazing ideas inside. This past month, I pulled it off the shelf and dug back into it again and found a few ideas that I would love to share. I really hope that you take some time to dig in and find some amazing gems that you might be able to use in your classroom. In chapter 2, there is a section on the importance of Mentorship. Throughout my career – not only as a beginning teacher – mentorship – whether formal or informal – has been an important part of my growth. In my first year, from Linda, I learned how to easily plan a Math unit that allowed for flexibility based on student learning and interest. In my second year, I learned from Toba how to truly engage students in the French language while making it relevant. In my third year, Alyson taught me the importance of connecting with students and genuinely caring for them not only academically but socially. I can honestly say that the list can continue and as the years progressed, there were often times more than one “mentor” from whom I was learning. I’ve always believed that there is something to learn from every experience and I think that I’ve been able to learn as much as I have because of the people around me. Pages 17 and 18 of the resource share models of mentorship. Take a look and see if you can find one that works for you. You never know where it might take you! Chapter 2 ends with classroom set-up. As many of you know, I was a passionate advocate of flexible seating in the classroom. Years ago, my students worked on a Math project where they re-designed our classroom while taking into consideration their learning needs. They measured the classroom and petitioned our Principal for some money for items they thought would better meet their learning needs. Some wanted standing tables while other wanted opportunities to sit on the floor. We created a learning environment that worked best for us and the autonomy and increased levels of ownership in the classroom were an indication that students felt as thought the classroom was their space. Now I know that we were lucky in that we were given some money to redesign but since leaving that school, I learned 2 important lessons: where possible, let students design the space so they feel that sense of ownership in the space and be intentional about what you chose to include in your classroom space. This picture of our space looks quite full and I would have to say that every item spoke to who we were as a group. On pages 25 to 30, I love that each of the classroom learning spaces are different and yet the amazing educators can speak to the differences that they have included in their classrooms with intentionality. I just started feeling a little nostalgic about designing learning spaces! This resource has a variety of ideas meant to allow teachers and students get to know each other in the first hours/days/weeks of school. One idea that tempts me to ask around to borrow a classroom is found on page 52. 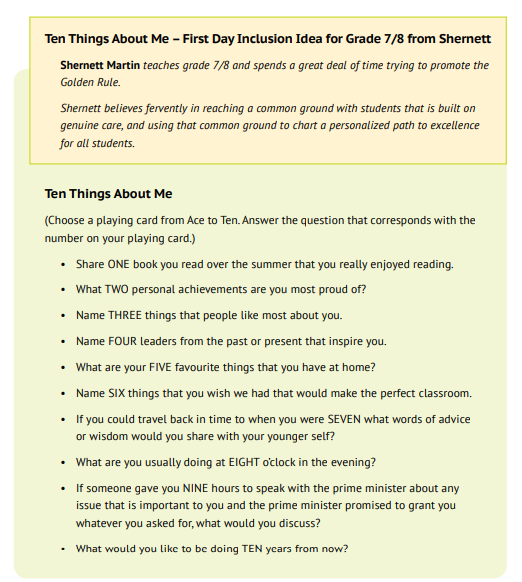 I love the prompts and think they’re great for getting students – and frankly even teachers – to get to know each other on a deeper level. Beyond the first weeks of school, I think activities like these really help to promote a sense of belonging and inclusion in classroom spaces. It’s report card time and I know that once again the crunch is on. Throughout my career there were many times that tips from others on best practices came in handy. This resource is FULL of great tips – and questions – that help to guide educators through some of the different aspects of our jobs. For report cards specifically, I really liked the Big Picture Questions on page 87. When reflecting on them, I think they would have been great questions for me to have asked myself during writing. If you haven’t already, please take a look at this resource. It’s fantastic! Not only for the beginning teacher but I strongly believe that every teacher could gain something from taking a read. Once again, I’m grateful for the Heart and Art of Teaching and Learning for the chance to reflect and hopefully I’ve inspired you to take a look for yourself!